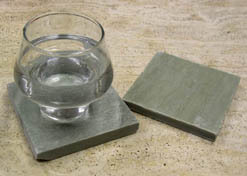 Our drink coasters are made from real natural stone. Below you can see that we offer a choice of several different types of stone which your order can be fabricated from including sandstone, slate, limestone, and real fossil stone. 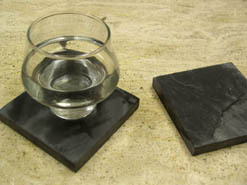 All of the materials we use in the design of our drink coasters are naturally absorbent, and will soak up the condensation from a wet glass. 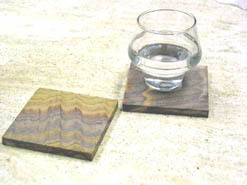 The coasters will then store the moisture within their minute pores, slowly evaporating it out over time. 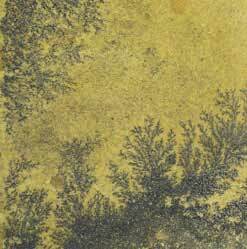 The natural features found in each coaster we sell are formed naturally, and are unique to that piece, making every single coaster a one of a kind work of natural beauty. This ensuires that your custom set will be unlike any other in the entire world.